When searching through volumes of parish registers – yes, in the days when you actually could look through the registers, I remember coming across many titles as christian names. My initial thought, as a beginner in family history, was wow! Someone of note in my tree. Yes, that feeling lasted only a few short weeks until I realised that many parents gave their children such names as Squire, Baron, Duke and Earl. The girls were also given titles as their first name for example, Lady and Princess. A search of one of the census found one young lady was named ‘Lady May Mafeking Pretoria Barnes Smith’. What had been happening around the time of her birth to warrant her names? Before we learn a little more about Lady May, I looked in the 1901 census for Squire Ramsden and within a small area there are 5 men with that name ranging in ages from late 50’s to teens. Leading up to the time of Lady May’s birth, Britain and her forces were fighting in South Africa. Mafeking was one of the most famous British actions in the Second Boar War (Oct. 1899- May 1900), most of us have heard of the Relief of Mafeking. Pretoria, the city surrendered to the British in June of 1900 – all this was happening at the time that little Lady May was getting ready to come into the world. Well, who is Lady May ? Firstly, as in my previous post, her name has been mis-transcribed – What’s new ? In the 1901 census Lady May can be found on the index as ‘Lady May Magekins’ aged 10 months (being registered in the June Qtr of 1900) and her parents are James Barnes and his wife Annie. James and his wife also fell fowl of a mis-transcription – there names should be James Barnes Smith and Annie Barnes Smith. As you can see Lady May has been transcribed over two lines and totally wrong and with her name being rather wrong the second part of her name, has given the impression of a separate person- that is until you look at the actual document. It makes me wonder how many other people relatives have been wrongly transcribed giving them no chance of being found. 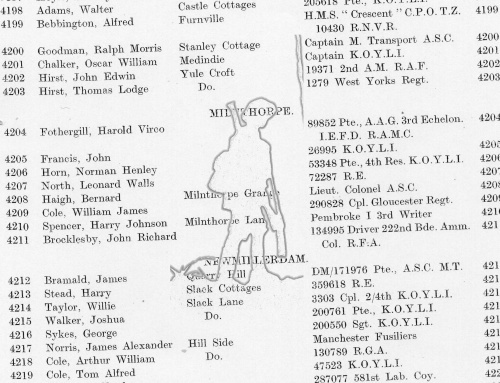 I know the number will be huge and would be fascinated to learn of the unusual or funny ways these names have been transcribed and placed in the on-line indexes – Let me know and I’ll post them here. Note: The Second Boar War brought Baden-Powell to the fore and Winston Churchill was taken prisoner and held in Pretoria but escaped. This entry was posted in General, News and tagged 1901, campaign, census, conflict, names, transcription, War, yorkshire on April 29, 2012 by carol. Why can’t I find him in the 1891 census ? Well, if you are just starting out on your family search and you are looking for a relative, there is a chance you will look, look again and then think what a stupid hobby and take up topiary – as the hedges will grow faster that your tree is. I was foolishly going off on a tangent and looking for Queen Victoria in the 1901 census, then thought better of it as she had died in the January, so off to search the 1891. I had looked for H M Victoria, Queen and Victoria born in 1819 but to no avail, desperation drove me to search for THE in the christian name box, lots of entries and some were very surprising including, The Leadbeater who when you look at the original census form is Thos Leadbeater. Then I thought I’d try HER and see what that brings up! Well, it brought up 70 hits and the one that made me laugh and feel very sorry for the beginner in family history looking for their relative. So, I’m looking for HM Queen Victoria among these 70 hits and I find this – Her Vest Black Van. Now, is this a name, no! It is a wonderful example of someone who has looked at a census document and written what they think they see. One question to ask, and an important question is, does this person have knowledge of British surnames? Another important question is, do they have a knowledge of British places? In this case I think the former is certainly a NO! But, they have a knowledge of English words, hence the transcription. It’s like the old quiz show ‘say what you see’. Who is Her Vest Black Van, well she turns out to to be a her after all, but a he! He is Herbert Blackburn the 7 month old son of John and Mary Blackburn and living Bolton. He was one of 8 children aged between 20 years old and 7 months. John worked as a printer compositor to feed his family and some of his children worked in the cotton mills. The moral of this story is don’t just search for the obvious. Another moral is think out of the box. If all else fails put your relative on the ‘back burner’, he is not going anywhere, and follow another side of the tree. Then, go back refreshed and full of enthusiasm, open your mind to searching wider i.e. searching by first name and year of birth with either a county or town – it will take you longer but all the spelling variations turn up. This would not help in the case of Her Vest Black Van, but you would certainly have had a chuckle along the way. This entry was posted in General, News and tagged 1891, 1911, census, family, names, places, transcription on April 25, 2012 by carol. A while ago I mentioned the the Absent Voters Lists as being a valuable source when looking for a WW1 soldiers army number, but I thought I would just update this and add to the information I told you about. So here goes – In the General Election of 1918 all those not at ‘home’, those who were away from their place of residence were classed as Absent Voters. The reasons you were away could be for example, working, visiting family or serving your country in WW1. The information for someone serving his King and Country usually included the following :- The man’s name, service and regiment along with rank and service number and his home address. 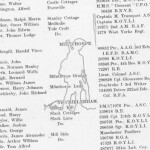 I say this information is usually included but in Morley his name and HM in a column are the only information you are getting, but it is still worth knowing he served. It was an Act of Parliament passed on 6th February 1918 that allowed service men to register and obtain their vote ‘at home’. The first lists were published on 15th October 1918 and again on 15th April 1919 and the details were provided by the voters. Men aged 21 and over could supply information about their vote, so for us family historians, a young man under the age of 21 but still serving his country could not vote. Also, something to be remembered – a soldier’s number was not his for his service. A soldier changed his service number for many reasons including changing regiment. You will find many service records or CWGC information with the words ‘formerly’, very kindly giving a previous service number. If you search for a serviceman by just his number you may find many men who were issued that number. For example a search of the SWDTGW for 2497 comes back with 100 men issued that number. It was not until 1920 that a unique number was issued to service men. Something else to bare in mind is that during WW1 Officers were not given service numbers but by WW2 numbers were issued and again they were unique. This wonderful source of information for Wakefield, has been transcribed and can be found here, the information has also been put on to a cd and is useful for those not wishing to use the internet and is available here along with many other useful tools for family historians. When looking for AVL’s you may like to try your local history library, local archives or pose a question on a local messageboard – it may save you time. Please note:- there is a chance they may not have survived in your area, so be prepared to use other sources to find the service number of your man i.e newspapers. Years ago a service number was a must for you to take your research further, now with the internet and some very useful websites a service record, if it has survived can be found by inputting varying degrees of information i.e. name and town if that is all you know, but don’t forget to allow for transcription errors and a search could get longer if a name and town, in all the spelling variations, brings up nothing – you may have to resort to just a town, a little long winded but does eventually pick up all the wonderful spelling variations that transcribers try to put in our way. Many family historians are a dogged bunch and are not easily put off by a name or town spelt in a way that bares no resemblance to what it actually should be. I think sometimes it is just ‘lets pick a few letters, jumble them up and that will do’. This entry was posted in General, News and tagged Absent Voters Lists, Army, Electoral Registers, Leeds, military, names, Navy, RAF, records, Wakefield, WW1, yorkshire on April 22, 2012 by carol. In a few short days it is 100 years since Titanic was lost at sea and in recognition of this Ancestry have just launched a set of records relating to this, including survivor list, crew lists, deaths at sea and grave lists. Some of this information is very interesting for those of you who have relatives connected with the disaster. One example of these records is for Charles C Jones, he was referenced as body no. 80. Estimated to be about 45 years old with light coloured hair. His clothing is listed as :- evening dress, grey leather lined overcoat and black boots. And his effects were as follows :- Silver watch with C. C. J., gold pencil, three gold studs, letters, knife, eyeglasses, America Express Co. cheque book. $19 in bills in back pocket, 13/4 halfpenny and £2 5s 3d in purse. Charles of Bennington, Vermont was a 2nd class passenger and the form was signed for by Jas. H Donnelly. To view these records visit then click on the home page click view all records in the ‘What’s happening on Ancestry’ section. This entry was posted in News on April 5, 2012 by carol.